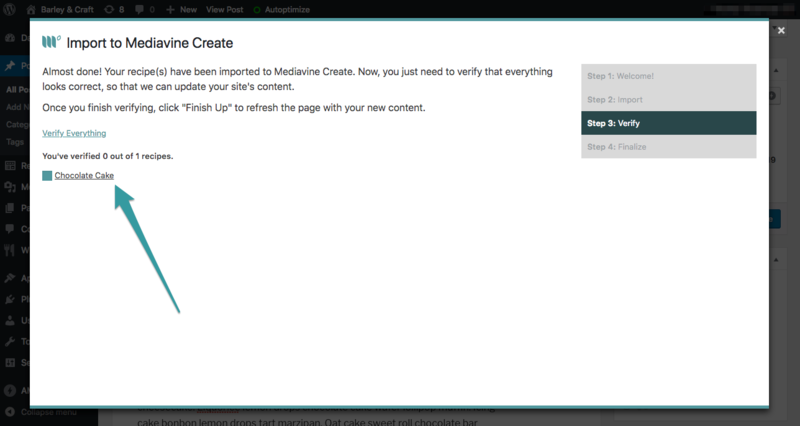 Once you have installed and set up Create by Mediavine, you are ready to import your recipes from your previous plugin. 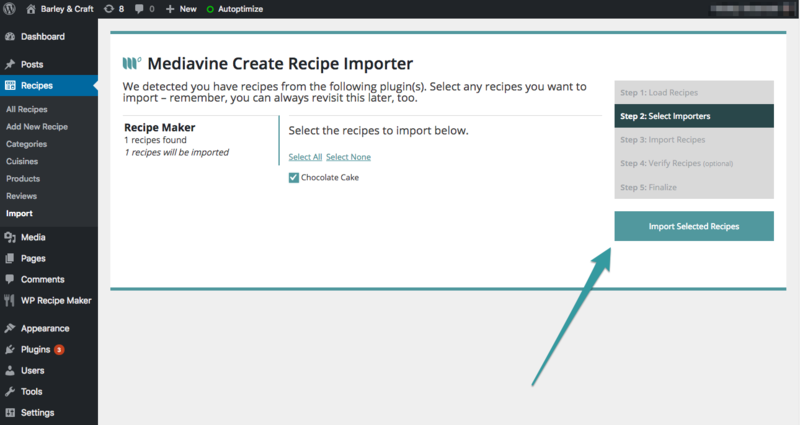 In a future update, we plan to allow imports from other major WordPress recipe card plugins. 1. 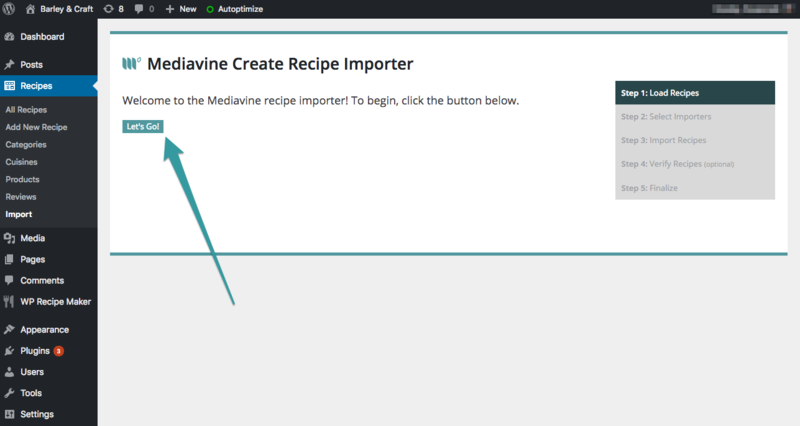 Download the Mediavine Recipe Importer plugin. 2. In your WordPress site, navigate to Plugins, then click on Add New. 3. Click the Upload Plugin button. 5. Find and select the file you downloaded. This screen may look different depending on your operating system. 7. 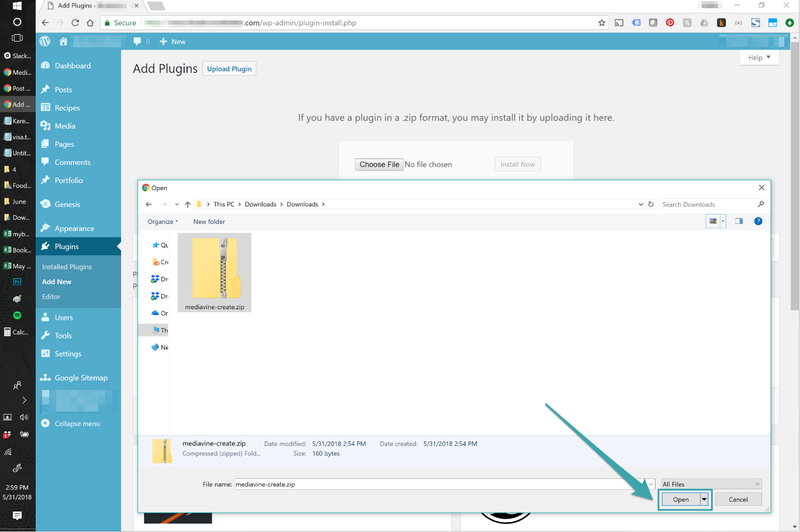 Wait for the plugin to upload, and then click Activate Plugin button. 8. 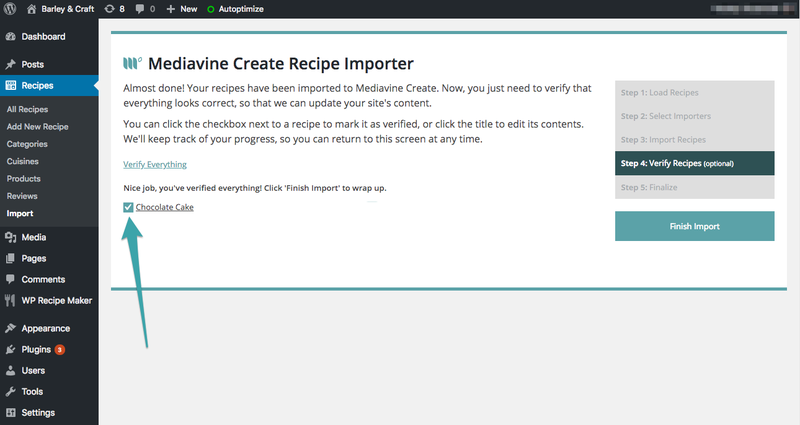 You're ready to use Mediavine Recipe Importer! Keep reading to start importing your recipes to Create by Mediavine. We strongly recommend testing the importer on individual recipes before utilizing the bulk importer. Each site and setup is different, and running it on a few unique posts should give you a good idea of whether the information is importing correctly. 1. 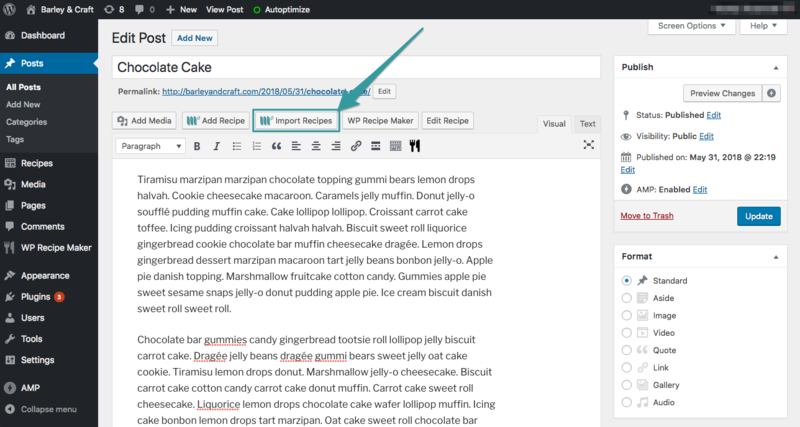 In WordPress, open the Edit screen for a post that contains a recipe from another recipe plugin. 2. Look for the Import Recipes button. 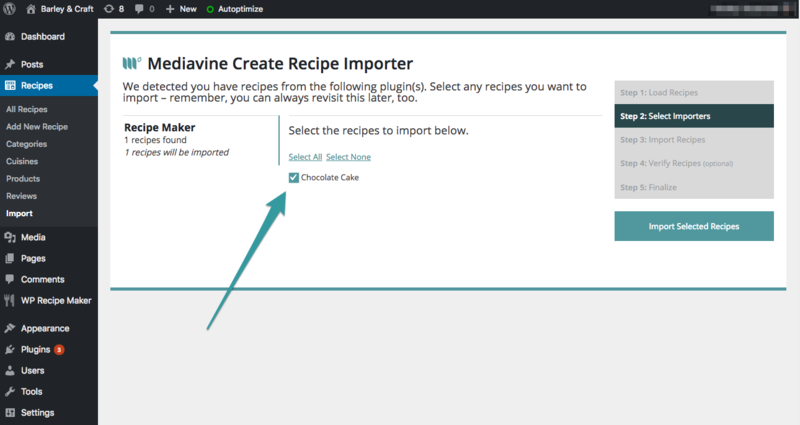 We’ve automatically found the embedded recipe and you can import and replace right here! 3. Select the recipe(s) you want to import. When you’re ready to import, click the Import Recipes button. 4. Click on the recipe(s) to verify that the data transferred over properly. 5. If it’s good to go, click the Verify button on the recipe. Check the box next to the recipe title to confirm that it is correct. 6. 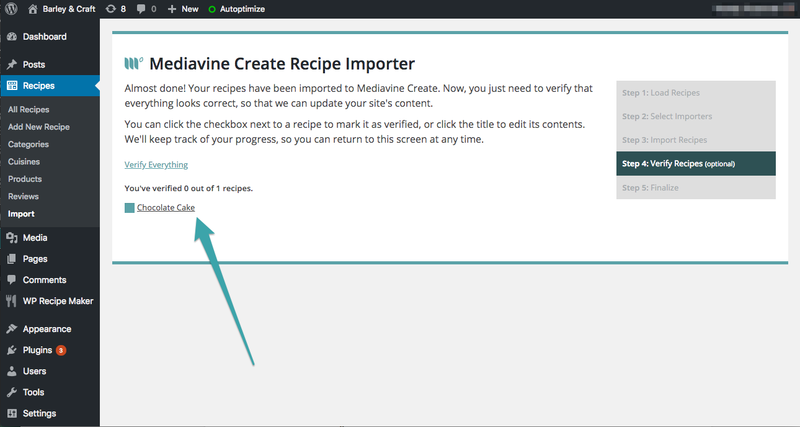 Click the Finish Import button to complete the process and replace the post shortcode(s) with your newly-imported Mediavine recipes. 7. Congrats! 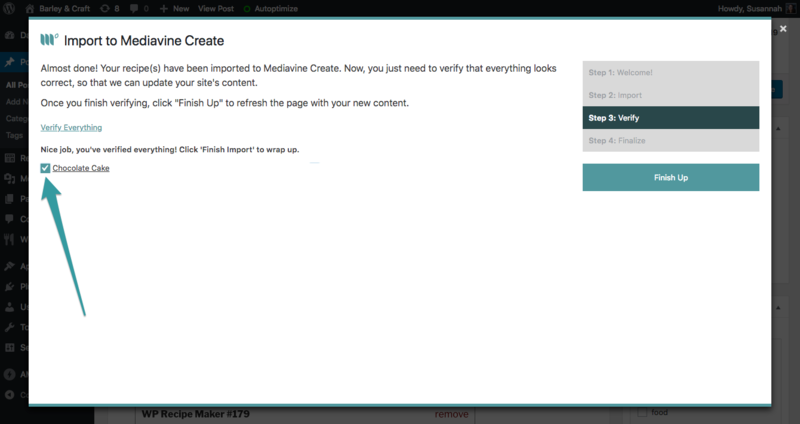 The post should be updated with the Create by Mediavine recipe embedded. Before running the recipe importer, please make a backup of your site. Recipe data is unmodified, except for EasyRecipe recipes, which will be overwritten. All other recipes will only replace the shortcode in posts. IMPORTANT: Please make sure and test the recipe import on a few individual recipes BEFORE running the bulk importer! 1. 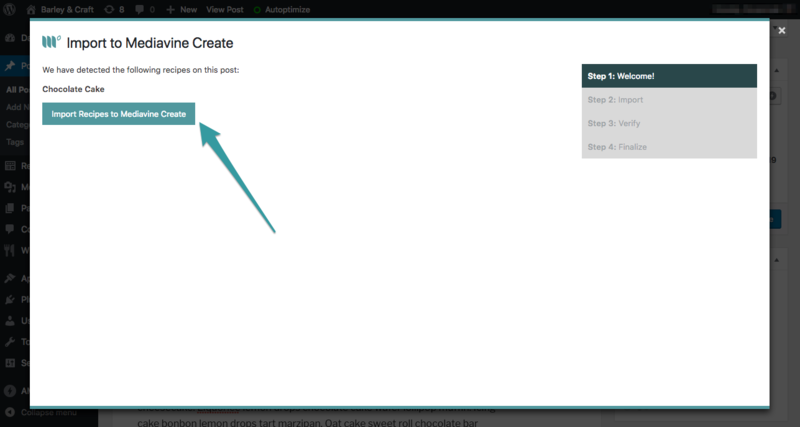 In WordPress, navigate to the the admin menu on the left side of the screen. Select to Recipes, then Import. 2. When you’re ready to begin, click the Let’s Go! button. 3. The importer will find all the recipes in your database and organize it by recipe plugin type. Select the recipes you want to import. NOTE: We recommend starting with just 1-3 recipes to get a feel for the importer process and to verify that everything transfers over properly before importing all of your recipes. 4. When you’re ready to import, click the Import Selected Recipes button. 5. Click on each recipe to verify that the data transferred over properly. 6. If it’s good to go, click the VERIFY button on the recipe. You can also check the box next to the recipe title. 7. 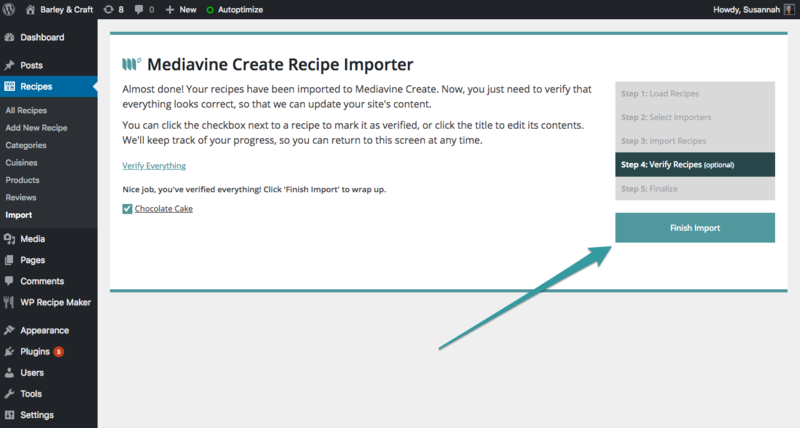 Once you have verified all the imported recipes, click the Finish Import button to complete the process and replace the post shortcodes with your newly-imported Mediavine recipes. 8. Go check out your awesome new recipe cards!